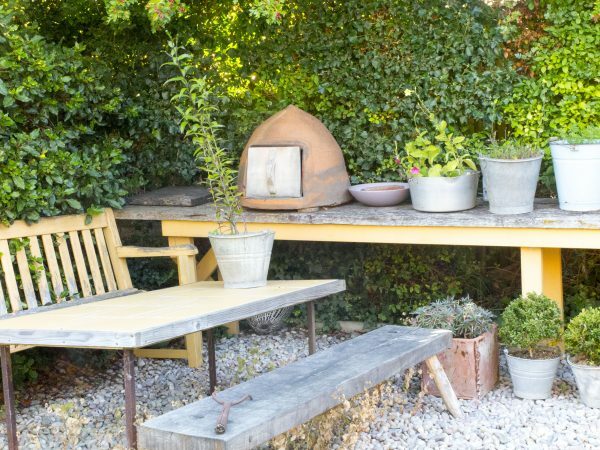 How to style your garden – smart tips and finishing touches. 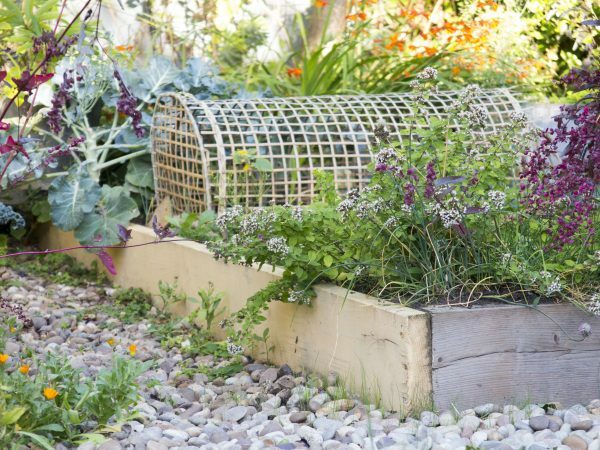 Designing a garden is about choosing a theme, then planning the hard landscaping and planting. Styling is about making sure it all works together, and adding the finishing touches. For example, are there any loose ends that need tying up – literally or metaphorically? Writer and stylist Francine Raymond’s terrace. The colour scheme – yellow/slate – connects the house to the garden. Francine is an instinctive stylist, and says that if she’d taken this picture, she would have re-arranged the tendrils of vine! Does your ‘style’ run through the whole garden, like a message in a stick of rock? Or have you got one thought in one corner and another completely different approach in another? 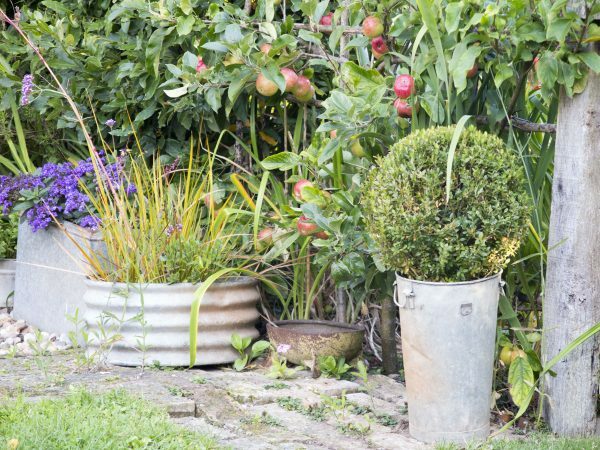 To ‘style your garden’ can also mean re-arranging a couple of pots and adding a cushion to make your garden look as someone cool has just drifted through, sipping champagne or home-made elderflower cordial. Telegraph writer Francine Raymond is a talented stylist. As a writer with a degree in Fashion & Textiles, she also combines good writing with a strong visual sense. She popped in to give me styling advice. 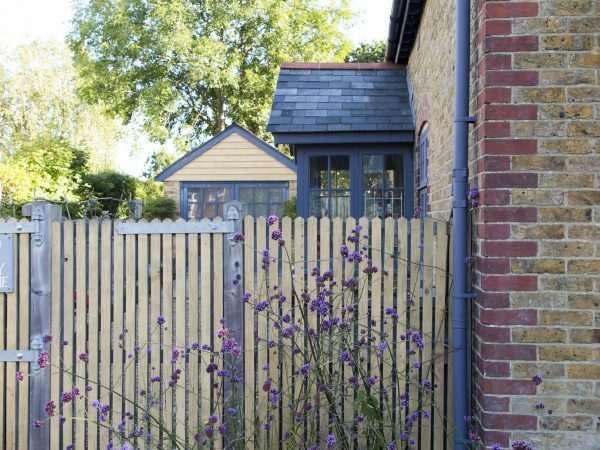 Starting with her yellow late-Victorian brick walls and slate roof, Francine carries the yellow/slate theme through to the fence, guttering, garage and even the verbena bonariensis planting. 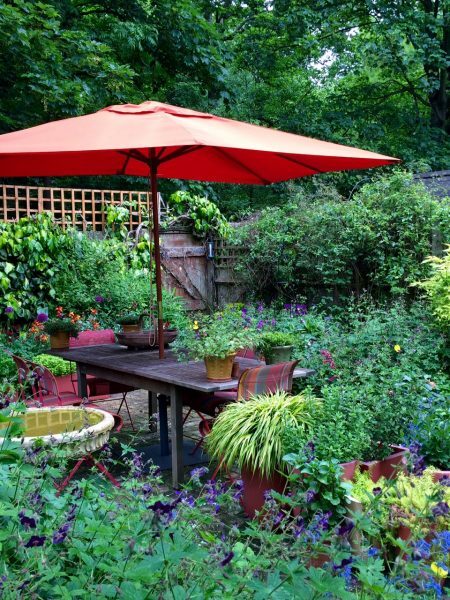 Garden blogger Julie Quinn’s colour theme is terracotta/blue, which she carries through from house to garden. 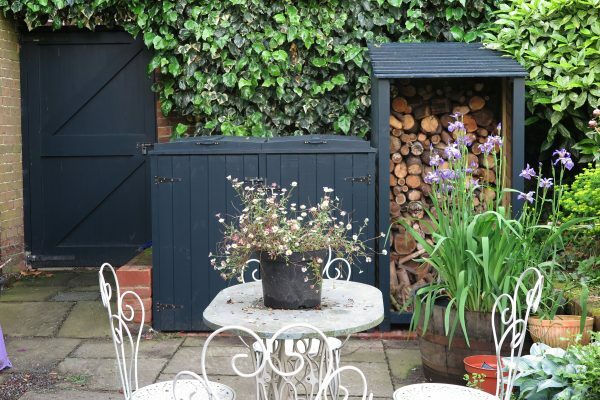 I’ve taken Farrow & Ball Blue Black through the front door, the back door, the shed, the log store and the bin store. But there it stops. Until Francine came, I hadn’t thought of taking it any further into the garden. Should I paint the bench? The pergola? The potting shed? I told Francine that I’d always considered ‘red’ to be a theme in my garden, because of the red brick walls, house, and the amazing dark leaves of the cotinus. As we have red brick walls, in the house and the garden, Francine suggests that terracotta pots would look good in our garden. However, the rest of our pots are a bit of a mish-mash. I’ve got quite a few galvanised ones, and I’ve been collecting stoneware pots. Still, they do go with the terrace. But my pots just never look as good as Francine’s so a bit more focus on this might improve things. One of my favourite photos from Doddington Place Gardens. 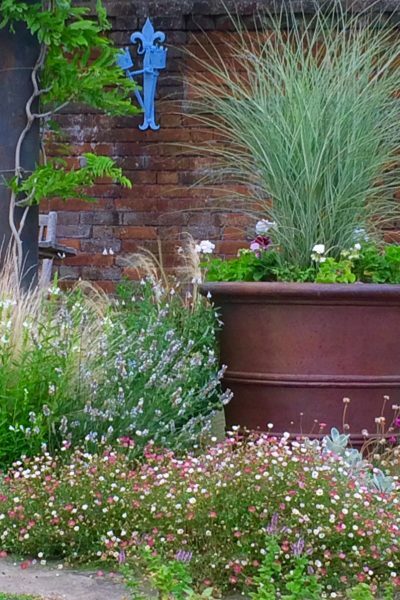 I love how the pot echoes the colour of the Victorian wall. Francine spotted a yellow jug of flowers on a table in the garden. 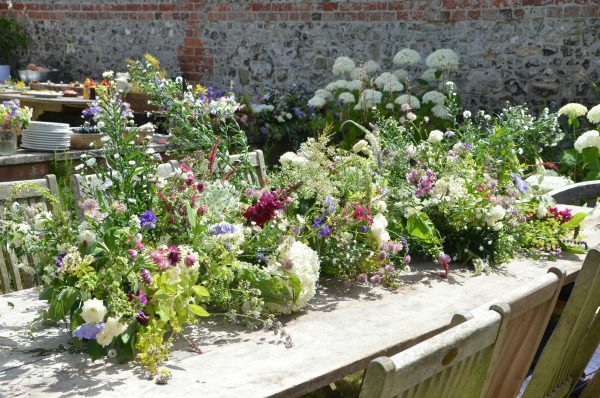 ‘If you put a vase of flowers on a garden table, she advised, echo the colours of the garden around it.’ There was no yellow in that part of the garden. In contrast, I took this photograph in Francine’s garden last summer. 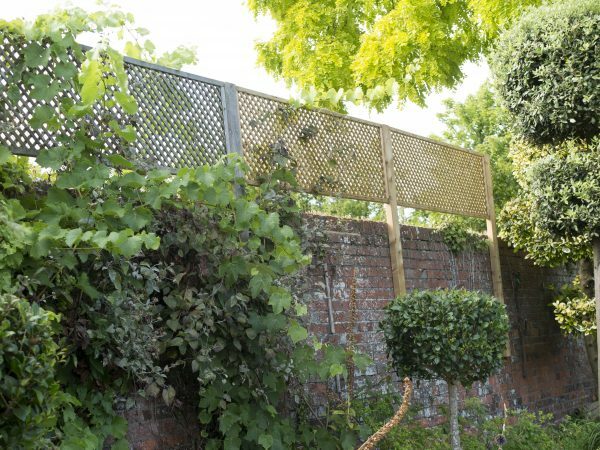 Her garden is divided in two, and the second section is wilder, separated from the house and terrace by a fence. Here she’s still using blue-grey and yellow for the furniture, but there are pink cushions echoing the pink roses. 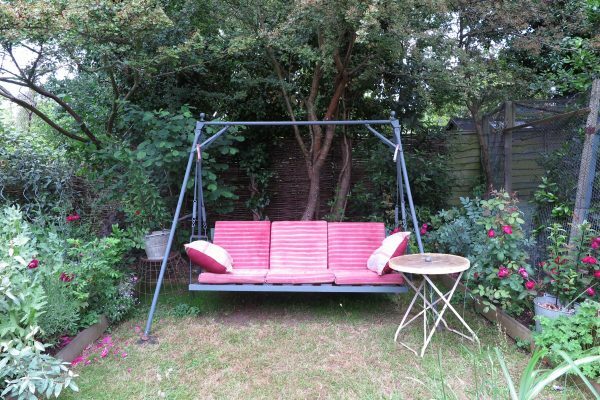 The pink cushions on Francine’s swing bench echo the pink roses in the garden. 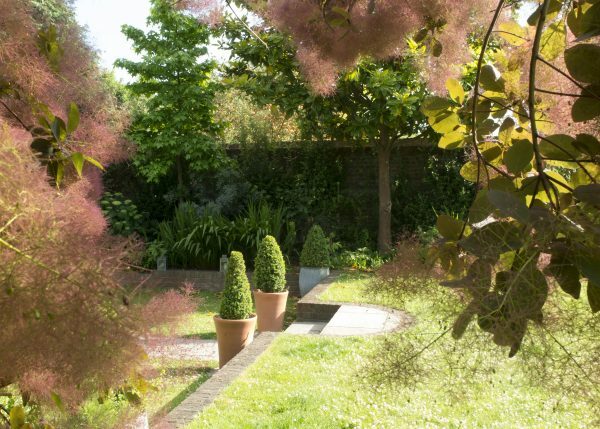 Garden designer Charlotte Rowe includes hydrangea ‘Annabelle’ in the flower arrangements to echo the planting behind. Photo by Jacqui Sinnatt. Anna Oates’ pretty white planter on the table has echoes of the delicate white jasmine behind it. We’ve recently had the roof of the potting shed replaced. The new wood of the roof rim stands out against the faded wood of the potting shed. Francine suggests painting the shed, so that new and old wood is disguised. 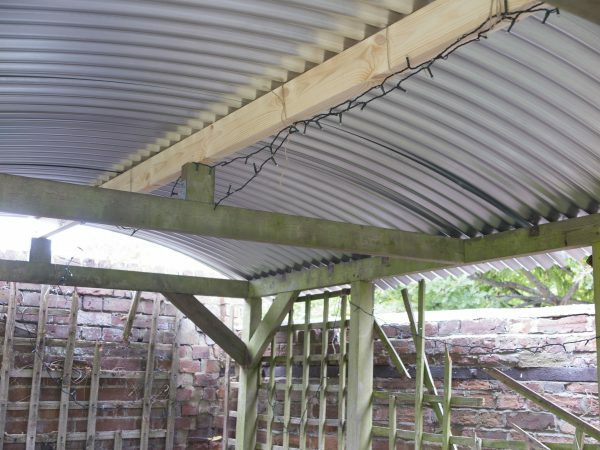 And when we had a corrugated iron roof put on our pergola to make it an all-weather outside room, we used one new beam with the old weathered cedar. That’s the sort of detail that stands out to a stylist. We should find a way of making the new beam match the old pergola struts – should we paint it? And the lights don’t look attractive during the day. The right hand piece of trellis was replaced a year ago, while the one next to it is about five years old. This is the sort of detail that unbalances the garden. ‘All lights look good at night,’ says Francine. ‘But they should look good during the day, too.’ As you can see from the previous photo, ours are straggly. We don’t have electricity in the Tin Corner, so all the lighting has to be candles or solar. So I bought some solar fairy lights that look pretty when they’re off. There is a dizzying choice in solar lights, but I whittled my purchases down to ProGreen Solar String Lights, which have lanterns,and Cmyk LED Solar Globe String Lights. These are like small glittery balls. 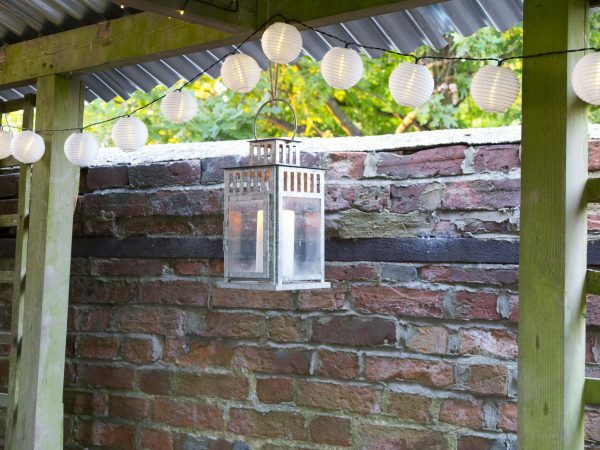 Cmyk solar globe string lights. We strung them tightly along the beam so that they look like a row of pretty buttons in the day time. Since Francine’s visit, Mr Middlesize has spent most of the weekend re-stringing the lights, and adding the new ones. 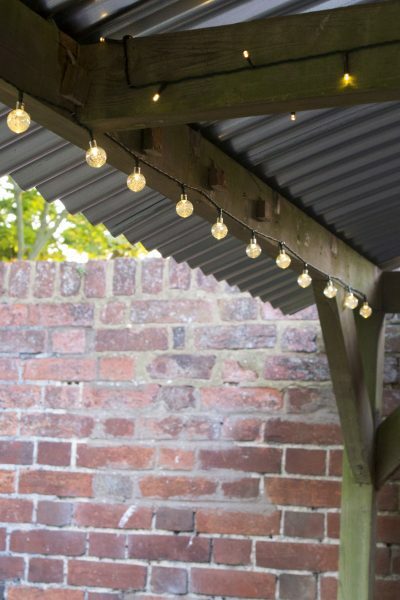 The little lights on a dark string are BlingString Solar Fairy Lights, which were sent to me for review last year (reviewed in a post about garden party decorations). They’ve been going strong for over a year now. Mr M has taped them up neatly now. And these are the lantern solar lights from ProGreen Solar String Lights, which look just as good in daylight as night-time. I bought the hanging lantern from IKEA several years ago, but there are some similar lanterns at Amazon. And here is the Tin Corner with all its lighting on. The BlingString Solar Fairy Lights are now neatly tied to the cross-beams. ….there has to be a common denominator somewhere,’ said Francine, looking at my garden chairs. 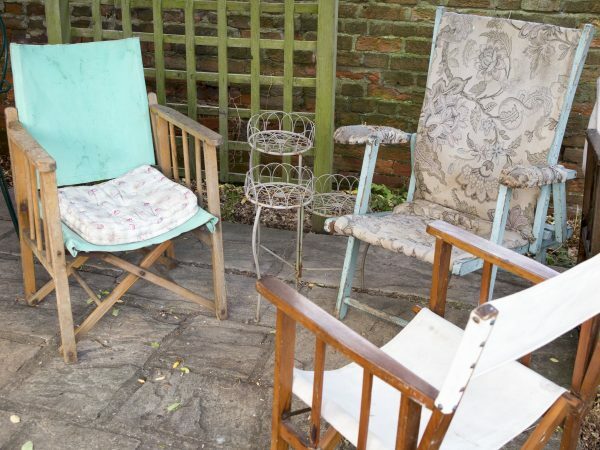 I think the best way to create a ‘common denominator’ is to paint one of more of the chairs – but what colour? Stylists are particularly good at making a mis-matched look appear charming, chic and relaxed, rather than just untidy. 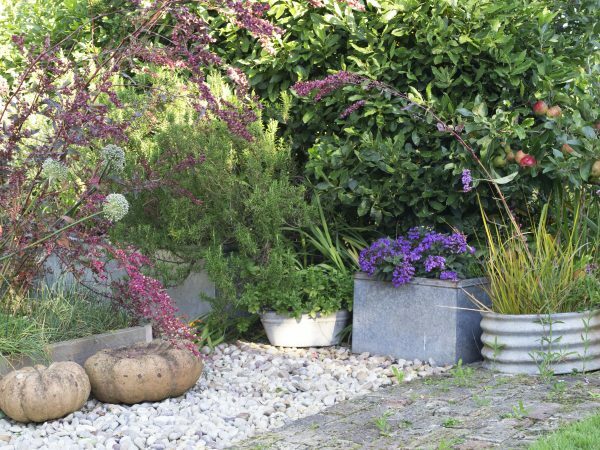 Francine’s mismatched pots and planters all have a common denominator – they’re in that grey spectrum with slate. Francine and I are both car boot fair shoppers. My mother had a stall at the ‘rough end’of the Portobello Road in the 1980s. So almost everything I own comes from a junk shop, auction room, market or car boot fair. 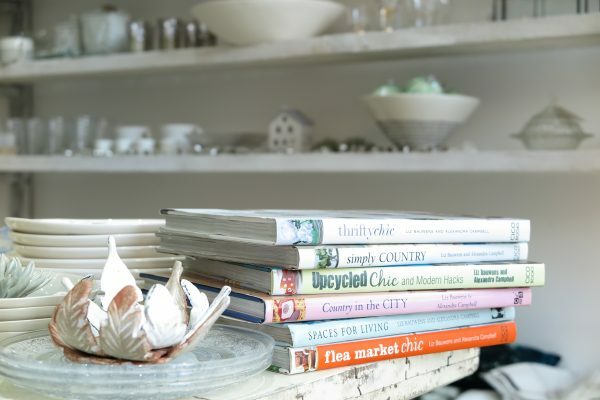 I’ve also co-written books on Fleamarket Chic, Thrifty Chic, and Upcycled Chic with stylist Liz Bauwens (there are some affiliate links in this post – if you click through to buy, I may get a small fee). Liz now has a wonderful shop full of original and vintage finds called Otto Trading in Acton. When we did the books, Liz did the styling and Simon Brown, the photographer, photographed it. And I wrote the words. So, although I’m an experienced flea market shopper, I don’t have quite the stylist’s eye that Francine and Liz have. Our books in Otto Trading, Acton. Do visit it for styling inspiration. This means I have to be very focused when I go to a car boot fair, vintage market or junk shop. I set out with an idea of what I want – such as a small table for a particular corner. Then I scour the shop from left to right – or go up and down the aisles of the car boot or market from start to finish. Ruthlessly ignore everything that isn’t a small table. Francine uses paint to create a ‘common denominator’ amongst her various benches, tables and other vintage finds. 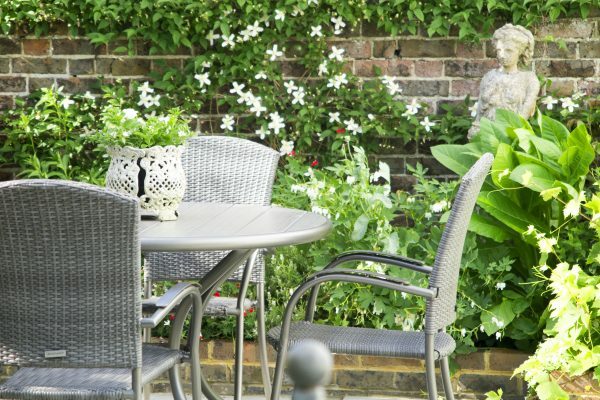 If you want to style your garden, try to develop a speciality, such as blue-and-white china or pressed glass. You’ll soon be able to spot your favourites in a pile of junk. All kinds of tin and zinc fit into Francine’s theme of yellow and grey-blue. Pots in Francine’s garden come mainly from junk shops and car boot fairs. There is a case for saying that we tend to choose the same sorts of things most of the time. So if you buy flea market finds, there’ll naturally be some common denominator. And quite often, there is. But if there isn’t, Francine will paint a pot so that it fits into the scheme. 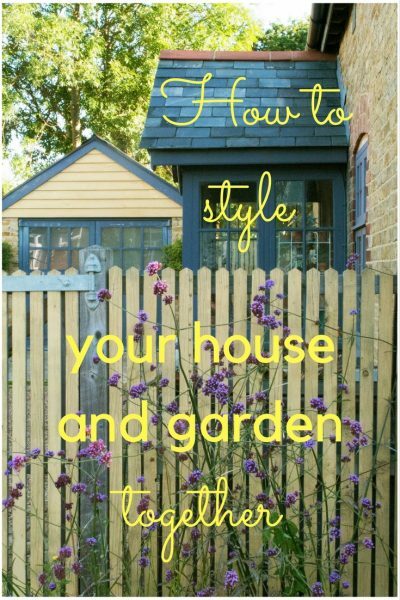 And that’s what you need to do if you want to style your garden, so that it looks casual but right. My pots and chairs are just a bit too mis-matched. Even I feel that they look untidy. Francine found this cheap, shiny metal container in a chain store, and painted it in her signature blue-grey. 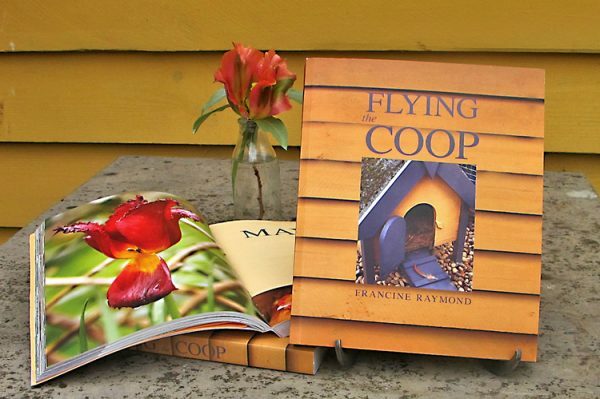 Francine’s written about creating her Whitstable home and garden in her latest book, Flying the Coop. Note the signature yellow/slate cover! Keep up with Francine: @FrancineHens on Twitter or @FrancineHens on Instagram. It was really interesting to have someone else look at the garden – I’d really recommend it, if you want to give your garden a lift. I wish I’d thought things through at an earlier stage – like the new beam on the old pergola, for example. When the vines die back in winter, I hope to do something about the trellis. However my colour palette is the terracotta red of the old brick walls, and Farrow & Ball’s Blue Black. They do look good together (I think), but I’d like a third colour to lighten it all up. Grey? Pink? 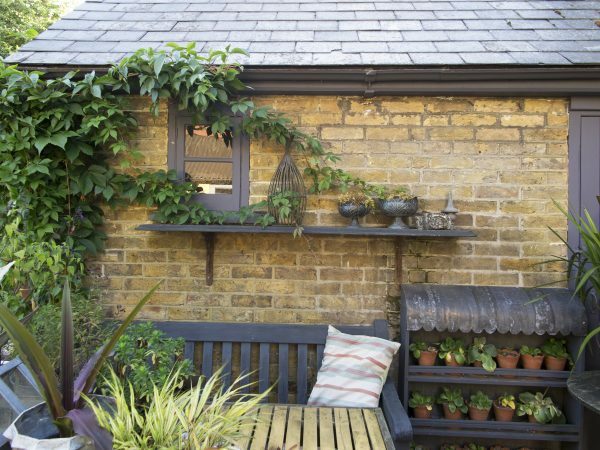 9 comments on "How to style your garden – smart tips and finishing touches." I was so disappointed that I missed Francene when she visited Veddw – and now so much more so! It’s magic to have a keen and helpful eye on your garden (hence my interest in garden criticism). It can offer you such a lift. And it’s a delight when someone really sees it. A fresh eye is always so valuable, especially when someone is as visually talented as Francine is. Lovely blog. We bought a house in Reading last October. I designed the garden and outsourced the hard landscaping in March. Been having fun playing with it ever since. 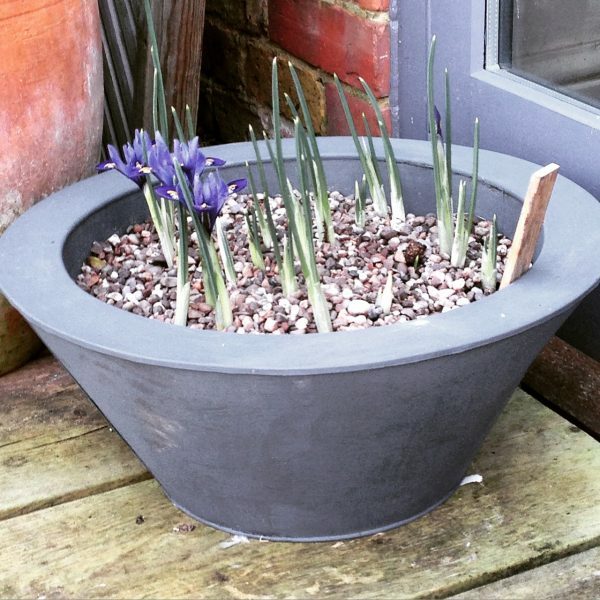 Few things that will change for next year – loving all your pots which I def want to incorporate around! I have gone for Blue/Purple/Pink colour scheme – the shed looks like a bi flag! Love your grey/yellow combo – what about purple or even add in F&B’s Vardo – I have it on our front door, gate, and dappled throughout the house! I’ll have a look at Vardo – I’ve been thinking about using Calluna, which is a pale heathery lilac grey. Blue/purple/pink sounds great. Thank you so much for your timely article. I realise I was about to make a mistake with my new shed. We are re designing a garden which is totally visible from the house at the moment but which will have a path all around it with different bits to walk, or scooter in the case of the grandchildren, through. I had forgotten that the shed will be visible from the house until the plants grow up. I just love your articles because you write so well and show problems as well as solutions. The chairs are lovely and two of them are already linked with the pale blue of the cushions and paint. Have you thought of this for your third colour? Then you can have pink plants with it if you like pink? I love the grey material on one of the chairs and it would link in beautifully if you used your Farrow and Ball paint on the timbers of your lovely dining area? I look forward to your articles every week because I am of necessity only an armchair gardener. They cheer me up and get the ideas flowing because they are so interesting and often on topics that the usual gardening books don’t cover. Thank you so much. Thank you so much! And the pale blue is a really good idea as a third colour. 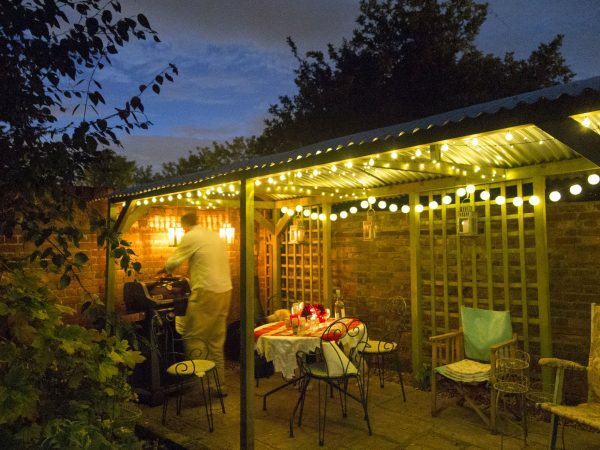 How lovely to come upon a picture of our back garden in your blog today! Getting the look right does make such a difference because if it’s right then one feels comfortable in the garden and hardly notices why. Your blog today has given me lots to think about. Good advice to ask someone else to look – as we only see what we usually see. Posy Gentles suggested I take our wisteria down – it had never occurred to me- and now I am so glad we did. Thank you. I think your terracotta and orange is excellent (as is Posy’s advice). It’s actually great fun to have someone come round the garden and point out the bits I’d forgotten about, though it can be a bit daunting. I just wish I’d done it sooner, as it’d be alot easier to paint a beam out before it’s attached to the pergola.